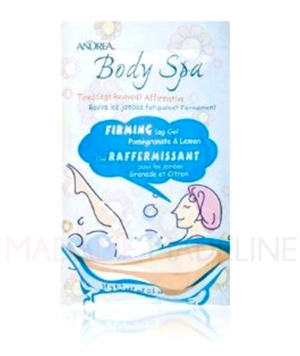 Andrea Body Spa - Firming Leg Gel 14g/0.5oz - 1 Packet. Revitalize tired rundown legs while firming and toning them! The virtues of Lemon are widely known - tone, moisturize, and purify and Pomegranate firms, soothes, and hydrates your legs, leaving them feeling invigorated. You'll be ready to put on that miniskirt and dance the night away. To Use: Massage onto entire leg. Ingredients: Water, Propylene Glycol, Algae Extract, Citrus Medica Limonum (Lemon) Fruit Extract, Punica Granatum (Pomegranate) Extract, Glycerin, PVP, Butylene Glycol, Carbomer, Triethanolamine, PEG-40, Hydrogenated Castor Oil, Fragrance, DMDM Hydantoin, Iodopropynyl Butylcarbamate.